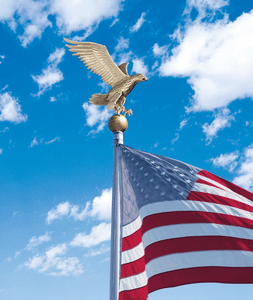 Your flagpole will be the envy of your neighbors with the addition of one of our beautiful Eagle flagpole ornaments. These Patriotic and majestic looking eagle ornaments are available in small, medium and large. Choose between life-like multi colored, Gold/bronze or Pewter. Flagpole Topper. Made of 100% recycled aluminum, these flagpole decorations will stand up to the harshest of conditions. Note: Flagpoles are not included.